NEW YORK (CNNMoney) -- It's been two years since the recession officially ended, but for job seekers, the economic woes are far from over. Vicky Cianci, 45, was laid off in May -- marking the third layoff in as many years. The administrator says the inconsistencies in her recent job history hurt her future job prospects. "I've downgraded myself over the years. I have 30 years of job experience overall, but I'm trying for mid-level positions with no luck," she said. Millions of other job seekers have had similar experiences, as hiring remains near a standstill. 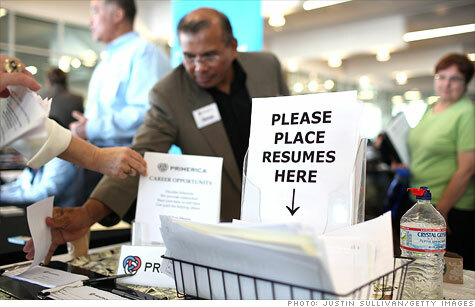 The economy gained just 18,000 jobs in June, while the unemployment rate rose to 9.2%. This rate is "well below what the economy needs just to keep up with population growth, never mind making up for the number of jobs lost since the start of the recession," said Claire McKenna, a policy analyst at the National Employment Law Project. Overall, the job market is still far from making a full recovery. The nation has only gained back about a fifth of the 8.8 million jobs lost during the recession, leaving millions of people still looking for work. Even employers who have jobs seem reluctant to fill them. Dan Ryan, owner of a boutique search firm in Nashville Tennessee, says he often sees positions sit unfilled for months on end. "The process is dragged out. [Candidates] apply, but they never hear back," he said. "Some employers do a good job of keeping their candidates informed but most do a terrible job." "I am finding opportunities to apply for, but it is slow getting responses and some companies are putting postings out there, but it appears they are not moving them forward," said Frank Turckes, an IT project manager in Tampa, Florida. Turckes, 47, was just laid off from his job in April. He hired a career consultant to jump-start his search for a new position -- to no avail. "I've been doing a lot of networking, using LinkedIn like crazy, I have sent over 300 resumes," Turckes said. "I've had only one interview but the company withdrew the position." For hiring managers, just sorting through the sheer number of applicants per position is an arduous and time-consuming process. Ken Pinnock, associate director of human resources at the University of Denver, says the school is actively recruiting but because so many people apply, it takes longer to fill positions now than it did it the past. "There was an alumni relations position in our law school and there were approximately 150 applications submitted from all areas, from corporate America to education. The breadth of applicants is a lot broader," he explained. "That adds to the amount of time it takes." For many other firms, uncertainty about the economy has put an indefinite stranglehold on future hiring plans altogether. "Employers are monitoring expenses very carefully. For now, they are going to get by with whatever they have," Ryan said.